Everyone knows that New York City is an extremely expensive place to live. If one is lucky enough to find a place that one likes one must often pay in rent per month what would easily be a mortgage payment in a more sane part of the country. So is it any surprise that free housing conveniently located near entertainment, the workplace, and food supplies would have more applicants than units of housing available? And that when the free housing is just provided with no orderly way of deciding who gets what unit that fights break out? Fortunately, I am talking about Tree Swallows battling for nest boxes at Jamaica Bay Wildlife Refuge: if this post were about people I probably would have taken a stray bullet trying to report the story, at least, I would have if people fought over housing like Tree Swallows do! Tree Swallows don’t look particularly tough or mean, in fact, they are kind of cute-looking and sounding. But when the biological imperative to breed is on the brain, and springtime is peak time for thinking about breeding, they can become raving psychos, each bird desperate to lay claim to a nest box that would allow it to raise young and thereby pass on its DNA to the next generation and win the evolutionary sweepstakes. Of course, there are more birds than boxes and this is where the raving psycho part of things come in as challengers that lack a nest box try to drive off whichever bird has possession. 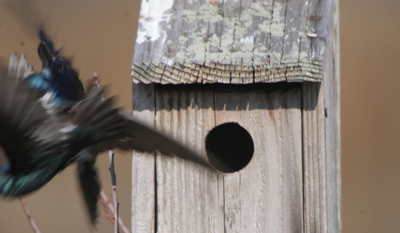 Tree Swallows like being evicted even less than humans do (at least, they fight back harder than anyone I’ve heard of fighting back in the recent subprime lending mess) and the brawls can last awhile. How intense is the competition? The birds will even dispute ownership of substandard housing just so long as it is a house. While watching the fighting over boxes I saw swallows driven to the ground in a flurry of feathers a couple of times, and twice saw birds fly into each other hard enough that I could hear the impact. 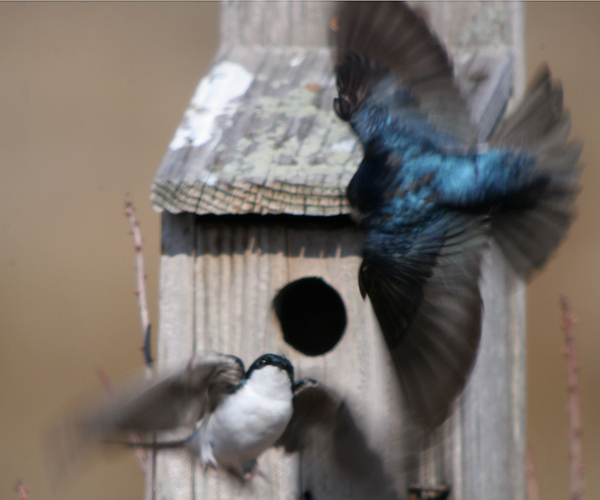 To Tree Swallows, possessing a nest box is an existential struggle and there is no pulling of punches (if creatures that lack hands to make fists can be thought of as throwing punches). 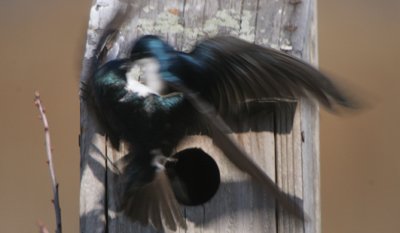 Below is a quick sequence of a nest-box owner being attacked by another swallow that wanted the nest box. Please excuse the blurriness: the birds were moving fast but I think you’ll get the general idea as to the violence involved. In this particular case the defender managed to hold onto the house despite the repeated attacks. I waited around for about ten minutes after the five-minute-fight to see if any other birds would challenge the relatively-exhausted victor but none did. Perhaps they witnessed his victory and were intimidated? Were I a Tree Swallow I would be scared to take on someone who could take hits like that above and make moves like those below and win such a hard-fought battle! 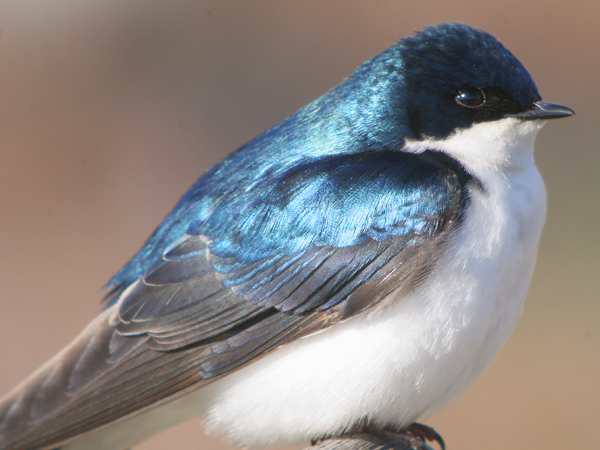 So the next time you see an iridescent blue Tree Swallow or hear its chirping and decide that it is a cute little harmless creature remember that Tree Swallows can survive a battle that would kill a gladiator, and be glad that Tree Swallows are significantly smaller than people, or it might be you getting evicted from your home! This post has been submitted to Bird Photography Weekly #34. Go check it out! This post was first published in April of 2010 but a post like this is too cool to keep hidden in the archives! Very nice Corey. I think the “blurriness” better conveys the action than any other shots would. You’ve definitely captured that drive to procreate. 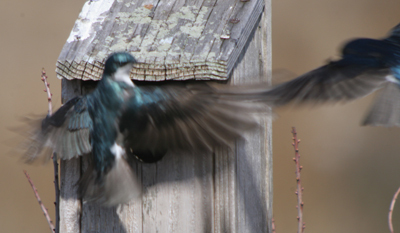 Great series of photographs capturing the Tree Swallow’s behavior! Wow Corey. Such violence in the bird world of cavity nesters. These are super captures by the way! I love the way you presented the information along with the photos. I monitor nest boxes that are available to Tree Swallows and have seen some great chases but nothing like this exhibition! Luckily for me, my bluebird trail that also attracts Tree Swallows is located where there are also plenty of natural cavities located in Oak Savannah. As a matter of fact, I recently found a Tree Swallow nest in the same tree as my White-breasted Nuthatch nest. 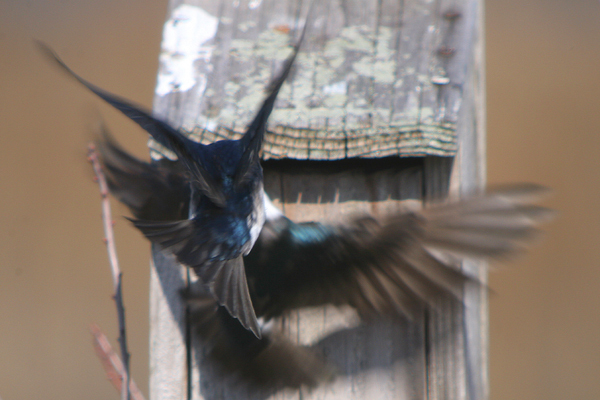 I you monitor Tree Swallow nest boxes, you will also be well aware of their “dive bombing” abilities. They are relentless when you are checking their boxes and come very close to you during their attacks. I will post some of those attack photos soon. They do travel VERY fast and they are tough to photograph while flying. You have done an exceptional job with this post Corey! Congrats!